Be the first to share your favorite memory, photo or story of Harold "Pete". This memorial page is dedicated for family, friends and future generations to celebrate the life of their loved one. 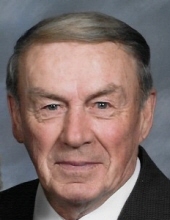 Harold “Pete” Joseph Means, 86, of Marcus, IA, died Wednesday, Feb. 6, 2019 at his home in Marcus, IA with his family by his side. Mass of Christian Burial will be 10:30 a.m. Monday, Feb. 11, 2019 at Holy Name Catholic Church in Marcus with Father William McCarthy officiating. Burial will be at Holy Name Cemetery in Marcus, IA. Military honors will be conducted by American Legion F.I. Goodburn Post #517 of Marcus. Visitation with family present will be 4-7 p.m. Sunday. There will be a rosary by the Knights of Columbus and vigil prayer service all at 5 p.m. at Holy Name Catholic Church in Marcus. Visitation will resume 1 hour prior to the service on Monday at the church. Harold was born Sept. 4 1932 at rural Marcus, IA, the son of Louis & Mary (Thiel) Means. His early years were spent on the farm and he received his education from Holy Name Catholic School. Following graduation, he worked for an area farmer before applying for induction into the U.S. Military at the same time of the Korean Conflict. Harold was stationed at Fort Riley, KS, and the Panama Canal. On Oct. 29, 1952 Harold and JoAnn M. Schefstad were United in marriage at St. Mary’s Church in Remsen, IA. Their first home was in Fort Riley until he was sent to the Panama Canal. When his tour of duty ended, he returned to Marcus where Harold and JoAnn rented a farm north of Marcus. Along with grain farming, Harold fed livestock, owned and operated a hog confinement and at one time housed 500 laying hens. In 1969, Harold purchased the farm where Harold and JoAnn lived for 51 years. In 2007, they retired from farming and moved into the town of Marcus. During their 66 years of marriage, they were blessed with five sons, David, Rory, Wayne, Ray and Jason. Harold was a member of Holy Name Catholic Church, the Knights of Columbus, American Legion, F.I. Goodburn Post #517 and he bowled on the Red Jackets bowling league for 25 years. Survivors include his wife, JoAnn of Marcus; five sons, David Means of Jackson, MN, Rory Means and friend Rita Sand of Marcus, IA, Wayne (Paula) Means off Granville, IA, Ray (Brenda) Means of Marcus, IA and Jason Means of Billings, MO; 12 grandchildren, 6 great-grandchildren with another one being born any day now; two sisters, Norma Cronin of Holstein, IA and Darlene Means of Marcus, IA. He was preceded in death by his parents, and infant brother and an infant sister, his brother, Clyde Means and his first wife, Norma Means, a brother-in-law, Francis Cronin, two sisters-in-law, Hazel Means and Helen Schefstad. Casket bearers will be, John Means, Mitchell Means, Zachary Means, Jeremy Schindler, Tyler Konz and Nick Rogers. To send flowers or a remembrance gift to the family of Harold "Pete" Joseph Means, please visit our Tribute Store. Visitation with family present will be 4-7 p.m. Sunday. There will be a rosary by the Knights of Columbus and vigil prayer service all at 5 p.m. at Holy Name Catholic Church in Marcus. Visitation will resume 1 hour prior to the service on Monday at the church. "Email Address" would like to share the life celebration of Harold "Pete" Joseph Means. Click on the "link" to go to share a favorite memory or leave a condolence message for the family.